On June 12, 2003, Peck died in his sleep at home from bronchopneumonia, at the age of 87. His wife Veronique was by his side. Peck is entombed in the Cathedral of Our Lady of the Angels mausoleum in Los Angeles, California. His eulogy was read by Brock Peters, whose character, Tom Robinson, was defended by Peck's Atticus Finch in To Kill A Mockingbird. To Kill A Mockingbird is a 1962 American drama film adaptation of Harper Lee's novel of the same name. 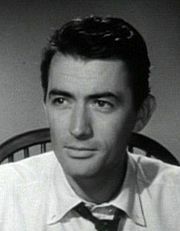 It stars Mary Badham in the role of Scout and Gregory Peck in the role of Atticus Finch. In 1995, the film was listed in the National Film Registry. It also ranks twenty-fifth on the American Film Institute's 10th anniversary list of the greatest American movies of all time, and #1 on AFI's list of best courtroom films. In 2003, AFI named Atticus Finch the greatest movie hero of the 20th century. This film marks the film debut of Robert Duvall, William Windom, and Alice Ghostley.